We enjoy playing roulette every now and then, especially if the game involved is of a high enough quality to recreate something approaching a genuine casino atmosphere. What can never be captured is the sociable aspect of a bricks and mortar casino but who cares about that when you’re playing from the comfort of your own sofa. 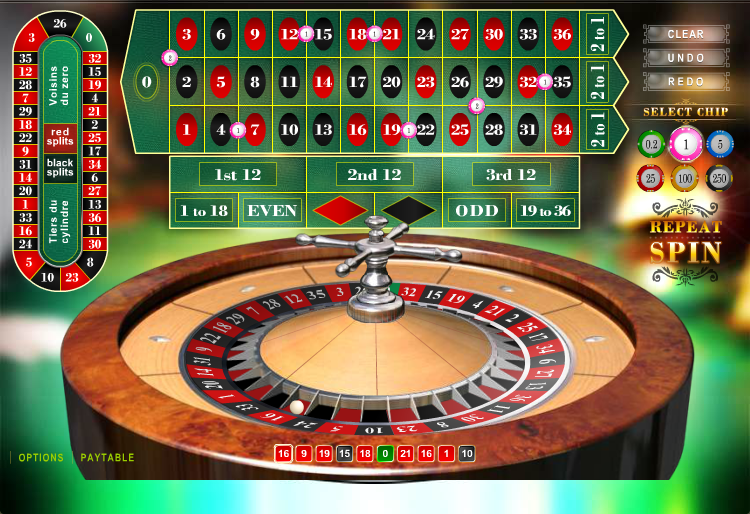 European Roulette is a game from Electracade which is obviously based on the European roulette table, meaning that there is just one green zero to spoil your day rather than two as in the American version. Load the game up and you are presented with a slowly spinning wheel in the foreground; above the reel is the basic betting table and to the left the ‘racetrack’ layout which offers some slightly more complex betting options. There’s a selection of chip sizes available on the right hand side with the smallest worth £0.20 and the largest £250.00. The maximum bet is £10,000. Now it’s time to choose where to place those chips and if you’re a novice a bit of trial and error will probably help out. Red Splits – a bet on each occurrence of two red numbers together on the betting mat. Black Splits – a bet on each occurrence of two black numbers together on the betting mat. Voisins Du Zero – a bet on zero and the 16 neighbouring numbers. Once you’re happy with your bets just click spin to literally get the ball rolling and cross your fingers. You can use the ‘repeat’ button to play the same bet again if you like it. There are no winning systems roulette, despite what you may read elsewhere on line but it’s quite fun trying out the Martingale system in particular. This is a bet on a (almost) 50/50 proposition such as black/red and all you do is double your stake each time you lose; when you win revert to the original stake. We like the layout of this version and the voice of the croupier sets the atmosphere nicely. There is no RTP listed for this game so although we hope it’s the roulette standard of 97.30% we can’t be sure.